This week, a synagogue in Cherkasy, in central Ukraine, was desecrated with anti-Semitic graffiti. Vandals wrote “Kill the Jews” and “Jews annexed Ukraine” on the walls of the synagogue. Another anti-Semitic incident took place in Kyiv, where a wreath placed by Israeli Justice Minister Ayelet Shaked at the Babi Yar Holocaust monument was torched. Disturbing incidents continue to take place in Kolomyya, in the Ivano-Frankivsk region in Western Ukraine. In recent months, a Jewish cemetery in Kolomyya was desecrated several times, and most recently vandals attempted to destroy the cemetery’s surveillance cameras. NCSEJ contacted Ukrainian and U.S. officials to urge greater security of Jewish sites, as well as apprehension of those responsible for the desecrations. Also this week, Ukraine’s government pledged to allocate $1 million for construction of a new Holocaust memorial at Babi Yar. The government plans to create two memorials, which would commemorate Jews killed at Babi Yar, and Ukrainians who saved Jews during World War II. Ukraine’s latest political crisis remains unresolved, but speculation is growing that a new prime minister will be named soon. Yesterday, media outlets reported that President Poroshenko’s party is supporting Verkhovna Rada speaker Volodymyr Groysman as prime minister. President Poroshenko said he expects the Rada to vote on the issue on March 29. U.S. Secretary of State John Kerry was in Moscow this week, and met with President Vladimir Putin and Foreign Minister Sergei Lavrov. They discussed a number of issues, including Syria and Ukraine. Secretary Kerry said that both sides agreed on the steps needed to strengthen the fragile ceasefire in Syria. A march to remember the Holocaust was held in Hrodna, Belarus on Tuesday. Members of the Jewish community and representatives of other religious confessions participated in the march. I want to recommend a story in the World Union for Progressive Judaism’s newsletter that highlights the Madregot Congregation in Tyumen, one of the largest cities in Siberia. Next week, Washington will host close to 60 world leaders at the 2016 Nuclear Security Summit, including heads of state from Ukraine, Georgia, Azerbaijan, Kazakhstan, and other countries in Eurasia and Eastern Europe. 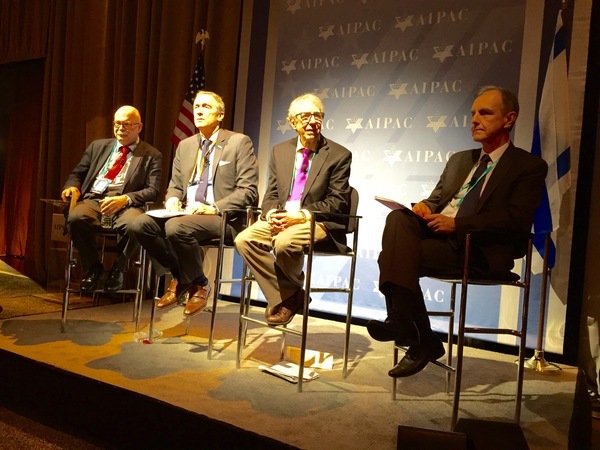 Last Sunday, I addressed two sessions of the annual AIPAC Policy Conference. The session entitled “Russian Relations: Moscow and the Middle East” focused on Russia’s expanding agenda in the Middle East region. Additional speakers included Former Minister of National Defense of Poland Bogdan Klich, Director of Carnegie Moscow Center Dr. Dmitri Trenin, and moderator Dr. Jonathan Adelman of the University of Denver. On behalf of NCSEJ, I want to express sympathies to victims of the terrorist attacks in Brussels and their families. Since the tragic events, many in the West have decried Russia’s efforts to politicize the attacks and the causes of the tragedy. The update includes several stories that detail Russia’s efforts to use this week's events as a political opportunity. Finally, I regret to inform you that Robin Saipe, a former NCSEJ professional passed away last night after a long battle with cancer. Robin devoted almost 15 years of her life to the cause of Soviet Jewry. She arrived at the depths of the movement, and was able to be part of the opening of the emigration gates allowing more than one million Soviet Jews to gain their freedom. May her memory be for a blessing, and may her family be comforted among the mourners of Zion and Jerusalem. presenting at the 2016 AIPAC Policy Conference. Vandals wrote “kill the Jews” on a synagogue in the central Ukrainian city of Cherkasy. In a separate incident, unidentified persons torched a wreath that an Israeli cabinet minister had placed for Holocaust victims in Kiev. The vandals used the word “zhyd,” which many Ukrainian Jews consider derogatory. Militants continue to violate the ceasefire terms and use weapons banned by the Minsk agreement against positions of the Ukrainian Armed Forces, the press center of the headquarters of Kyiv's army operation in Donbas has said. "All in all, the enemy has carried out 53 strikes against positions of Ukraine's Armed Forces in the past 24 hours. Most of them – 48 – have been recorded near Donetsk," the headquarters said in a report as of 6:00 a.m. on Thursday, published on the press center's Facebook account. Ukrainian military positions in Yakovlivka, Staromykhailivka, Lozove and the Donetsk airport area came under mortar fire, it said. U.S. Secretary of State John Kerry says his talks with his Russian counterpart, Sergei Lavrov, on the Syria and Ukraine crises have been "productive." "Spoke at length today with FM Lavrov about #Syria and #Ukraine," Kerry said on Twitter on March 24. "Productive dialogue with important partner." Kerry earlier said a "fragile" cessation of hostilities in Syria had "produced some progress," adding that he wanted to see a further reduction as well as greater flows of humanitarian aid. Lavrov said he intended to discuss "how the international community can assist in the settlement of the Ukrainian crisis." Russia's top prosecutor has vowed tighter control of nongovernment organizations' (NGOs) activities ahead of this year's parliamentary elections. Prosecutor-General Yury Chaika called on prosecutors on March 23 "to take exhaustive response measures" against NGOs "violating laws," including "their dissolution via court hearings." He also proposed to impose controls on regulatory and law enforcement agencies checking the NGOs' activities. In 2012, Russia adopted a law requiring any NGO that receives funding from abroad and engages in political activity to formally register as a "foreign agent." Ukrainian President Petro Poroshenko says he has called on the National Security and Defense Council to consider sanctions against Russian officials involved in the prosecution of Ukrainian pilot Nadia Savchenko. A Russian court has sentenced Savchenko to 22 years in prison for her alleged involvement in the death of two Russian journalists in eastern Ukraine. After the sentence was pronounced on March 22, Poroshenko said he was ready to exchange the pilot for two Russians who were captured during fighting in eastern Ukraine and whom Kyiv believes are Russian servicemen. Addressing journalists in the eastern city of Kharkiv on March 23, Poroshenko said the exchange would be possible only after Savchenko's sentence comes fully into force, meaning when the 10-day appeal period expires. Members of the Jewish community of Belarus took part in a “prayer march” to remember the Holocaust on Tuesday. Roughly a hundred people participated in the march, which took place in the city of Hrodna. Among the participants were Minsk Rabbi Grigory Abramovich, Orthodox priest Georgi Roy, and Lutheran pastor Uladzimir Tatarnikau. Although the march was initially set to take place through the entire old city, due to the cold weather, it was reduced to a walk from the entrance of the Hrodna ghetto to the Castle synagogue, belsat.eu reports. Several people spoke at the event, while others recited poetry. Many of the participants were elderly as well. At a memorial ceremony for 62 people who died in a plane crash in Rostov-on-Don in southern Russia, the city’s rabbi recited a mourning prayer for a Jewish surgeon who died in the incident. It's tempting to look at the bombastic Russian lawmaker Vladimir Zhirinovsky as nothing more than a clown and a buffoon. But he's not. He's more of a court jester and a messenger. He says the things the regime is thinking -- but can't always say out loud. And this is the context we should view his outrageous -- and outrageously insensitive -- comments last night in response to the terrorist attacks in Brussels. Two Kyrgyz opposition leaders have been detained as part of an investigation into an alleged plan to overthrow the government. The chief editor of the Bishkek-based Respublika newspaper, Zamira Sydykova, told RFE/RL that the detentions took place on March 24. She said several men who introduced themselves as officers of Kyrgyz State Committee for National Security (UKMK) took away the leader of the Egemen (Sovereign) Kyrgyzstan party, Bektur Asanov, and the leader of the Chyndyk (Truth) party, Kubanychbek Kadyrov, from her office. The Ukrainian government pledged to allocate approximately $1 million toward the construction of a Holocaust memorial monument at the Babi Yar ravine in Kiev. Ukrainian Prime Minister Arseniy Yatsenyuk announced the allocation of funds Wednesday, the news site 112.ua reported. The funds would pay for the construction of two memorial paths — one for Jewish victims and one for Ukrainian non-Jews who saved Jews — at the site where 50,000 Jews and some 50,000 to 100,000 other victims, including Roma, Russian prisoners of war and Ukrainian nationalists, were murdered by the Nazis and local collaborators between 1941 and 1943. In 1976, when Ukraine was still part of the Soviet Union, a massive monument was erected at Babi Yar without noting the site was the first massacre of its magnitude during the Holocaust. On a muddy path in Babi Yar Park, Vladimir Proch negotiates deep puddles as he shadows two rabbis and a group of Ukrainian officials. An 87-year-old Holocaust survivor, Proch lives near the Kiev ravine where Nazis and local collaborators murdered more than 50,000 Jews starting in September 1941. He has followed every twist of the 15-year saga to commemorate victims in a manner befitting the tragedy’s scale, which even by Nazi standards was extraordinarily barbaric. Ukraine's parliamentary speaker emerged on Thursday as the frontrunner to replace the unpopular Prime Minister Arseny Yatseniuk, signalling a breakthrough in a political crisis that has lasted months. Current and former members of the ruling coalition met to discuss nominating Volodymyr Groysman, a 38-year-old former mayor and ally of President Petro Poroshenko, but stressed the appointment could only work if parties can agree on a new coalition deal. Support for Yatseniuk's Western-backed government has plunged since he took power after the 2013/2014 Maidan protests and his government has been hanging by a thread since three parties quit the coalition, the first in September. Coalition infighting and corruption scandals have stymied reforms demanded by Kiev's Western backers and derailed negotiations for a new $1.7 billion loan from the International Monetary Fund needed to prop up the war-torn economy. Groysman might be a good compromise candidate to balance competing factional interests. But he would still need to convince the United States, the European Union and the IMF, all increasingly frustrated with Kiev, that Ukraine would honour its international commitments. Vladimir Putin’s maneuverings with the West and Ukraine are often compared to a game of chess. The comparison is spot on, with one qualification. Contrary to the image of grandmaster he prefers, the Russian president more closely resembles a loudmouthed barroom player who slams pieces against the board. The effect is intimidating at first, but the best way to beat him is to take a deep breath, stick to your strategy, and play a consistently offensive and defensive game. Unfortunately, President Obama isn’t very interested in playing chess with Putin. Maybe the State Department and the Pentagon are, but they’re hamstrung by Obama’s apparent indifference. The European Union, almost by definition, doesn’t play well. Indeed, its member states can’t agree on whether the game is chess, checkers, or soccer. Russia warned on Monday that it was prepared to act unilaterally in Syria against groups that it said were breaking the cease-fire there, injecting a volatile new element into a conflict that has been calmer in recent weeks. Russia’s Defense Ministry said the country’s military was ready to strike as early as Tuesday against groups that it said were violating the cease-fire unless U.S. leaders agree to discuss a Russian proposal for how to maintain the peace. So far, Russian warplanes have been observing the cease-fire, U.S. officials say. The ultimatum may be as much a negotiating gambit with the United States as it is a warning that Russia is about to act on the ground in Syria, from which it pulled a portion of its warplanes last week. The Russian military has sought close cooperation with the Pentagon in Syria; the Pentagon, angered by Russia’s actions both in Ukraine and in Syria, has held back. Secretary of State John F. Kerry is due to meet Thursday with Russian leaders in Moscow to discuss efforts to achieve peace in Syria. These days, the Russian government seems to observe jihadist terrorist attacks in the West with a thinly-veiled satisfaction, as well as a chance once again to rehearse its talking points that petty details such as the invasion of Ukraine ought not to be ignored in the name of counter-terrorist partnership. Apart from the fact that the Kremlin is unlikely to get what it wants from any closer cooperation, it should not be lulled into thinking what happens in Istanbul and Brussels cannot happen again in Moscow. This is being written the day after the attacks, when news is still breaking and rumors, assumptions and more than a little disinformation is flying thick and fast. Even if it is too early to be certain about the background and causes of the attacks, one can already see patterns in the responses, both political and practical, and consider what this means for Russia. One of the largest cities in Siberia, Tyumen, located in the Tyumen Oblast, was first established in 1586 as an important economical and industrial center in Russia. The only synagogue in the city, and the entire region, was opened in 1912, but from 1930 until 2000 it served various community purposes, including as a library. Madregot Congregation was established in 1992, and it was clear from the beginning that this congregation would have a modern, Reform Jewish affiliation. Community leader, Igor Varkin, started as the head of the youth club and, after completing training at the Institute for Modern Jewish Studies (Machon) in 2000, he became the para rabbinic spiritual leader of the congregation, leading services and conducting different lifecycle and holiday ceremonies in a variety of rented halls and activity centers. His wife, Elena Mozgovaya Varkin, also serves as a community leader for the congregation. In 1994, the city’s old synagogue building was granted to the community through a restitution process; after a great deal of time, money and effort, renovations were completed in 2000. The speakers were SAIS professor (and former U.S. Ambassador to Turkey) Amb. Eric Edelman, CACI fellow Avinoam Idan, CSIS Russia and Eurasia Program director Olga Oliker, and McCain Institute Executive Director (and former U.S. Permanent Representative to NATO) Amb. Kurt Volker. CACI director Svante Cornell moderated the forum.